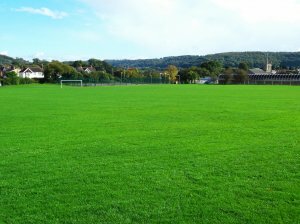 Located behind the swimming pool, on Kingshill Road, the 'Rec' is home to Dursley Town AFC, and also provides 2 tennis courts, a street skateboading area, a variety of play equipment, and a huge expanse of green with glorious views to Cam Peak. A new play park was opened in March 2015 and has been an excellent addition to the existing facilities. The "Rec" has two sets of outdoor gym equipment. Tennis for Free - the courts at Dursley War Memorial Recreation Ground have been resurfaced and are now open for public use free of charge. The key for the courts can be obtained from the Swimming Pool reception, a refundable £5 deposit applies.